But Dragon’s Milk was different. I could tell that the dragons were not human. They could communicate with humans, mostly using pictures and feelings rather than words (at least that’s the way it was with the little ones), but their minds were not human. It was an alien intelligence transcribed onto a page by a human for another human to read. While the similarities between horse and unicorns was the hook that got me into fantasy, I’m pretty sure that that idea, that image of dragons being a completely alien species, was the line and sinker that reeled me in and kept me from leaving the world of fantasy. And it’s something that I try to keep in mind in my own writing. Whenever I deal with beings that aren’t human, I have to remind myself that they have very different histories, cultures, outlooks, and bodies from humans. They may have very different wants, needs, and problems. 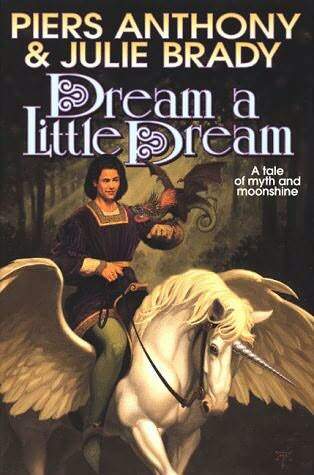 The next fantasy book that I read that had a major, lasting impact was Dream a Little Dream by Piers Anthony and Julie Brady. To my knowledge, this is a standalone work and isn’t connected to Anthony’s Xanth books. In fact, I have never read any Xanth (which I probably should rectify at some point.) Alas, I am guilty of judging books by their cover, and that’s usually how I decide to start something completely new. If I like the cover, I’ll read it. This one had a unicorn on the front (a winged unicorn no less!) so I started reading it. I was probably…hmm…eight or nine, ten at the most, so it wasn’t long after reading Dragon’s Milk. My parents let me get books from whatever section of the library I wanted. To my knowledge, they never insisted on previewing them for content or reading level. They trusted that I would chose things that suited me without any well-meaning adult interference. I’m very glad that my parents never tried to regulate my reading. But Dream a Little Dream had some content that probably wasn’t supposed to be seen by pre-teen eyes. Nothing explicit, as I recall, but there was the presence of abuse, certainly physical and possibly sexual as well. The tone is more like an urban fantasy novel (which hadn’t really been invented at the time) than of a more traditional fantasy. It’s dark, gritty, and focuses on the importance of dreams…and how easy it can be for them to be crushed. Dream a Little Dream is about the parallel stories of two women, Nola and Tina. Nola is trapped in an abusive relationship and Tina is a street-wise orphan. Both of them have a special power, the power of their dreams to become reality. Their dreams coexist in a world beyond our own, and the inhabitants can only survive as long as the dreamers known as Creators believe in them. If a Creator stops believing, their dreams cease to exist. And the mortal, human world is very, very hard on dreamers. Prince Michael is one of the inhabitants of the dream world and he is seeking a way to contact the Creators and urge them to keep dreaming, or else he and his entire realm will perish. This book had a very profound effect on me. It compounded the ideas presented in The Neverending Story, that stories are real, their characters are real and their continued existence is dependent on the fickle minds of humans. It gave the realm of dreams solid ground to stand on and presented the ugly truth I’d always sensed, but hadn’t quite grasped: living in the realm world can be a soul-crushing experience. There will be times, places, situations, and people in your life who will seek only your destruction, your mindless obedience, to bleed dry everything that you hold dear. And that no matter what, you can’t let that happen. You can’t let go of your dreams. Dreams are sustenance, and you need them as much as they need you. Perhaps moreso. Maybe it’s because I’m a creative type, but I can’t imagine moving forward without them. 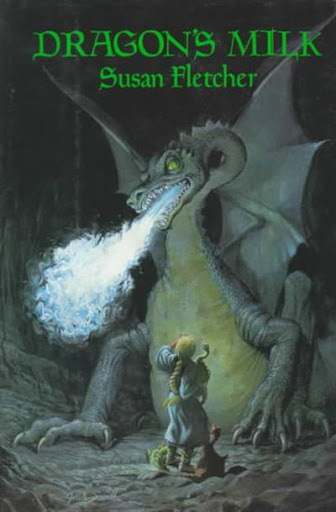 Going back to classic Fantasy, have you ever read The Worm Ouroboros? In modern Fantasy I hope you are going to include Roger Zelaznys Chronicles Of Amber! Don't know what you intend to cover, but hope you will cover some of the classic older writers. Robert E. Howard, L. Sprague DeCamp, Fritz Leiber, Michael Moorcock, Fletcher Pratt, Lord Dunsany, ect. As great as some of these authors are, sadly they are all but forgotten. You would probably like Fritz Leibers "Gray Mouser" series. Incidentally did you know that it's the same Fritz Leiber that appears in the old movies? He was an actor as well as an author. DeCamp can be hilarious at times, real sense of humor. Wow, now I feel silly. "Canticle for Leibowitz" was written by Walter Miller, Jr., not Fritz Leiber! The second you said "Gray Mouser" I realized I'd miss-applied the author's name. I have read most, if not all of the "Gray Mouser" series. Loved them! And no, I had no idea he was also an actor. Guess not all authors are anti-social recluses!